Liam once approved of helping others, but not anymore. He lost his mother due to a crazed street person, and he's hardened his heart. Now a successful photographer, he’s returned to set up shop in his hometown--directly across the courtyard from his sister’s best friend. Zoe runs an outreach center and encourages the homeless and needy, especially at Christmas. Nursing a soft spot for Liam that started as a girlhood crush, she sets out to help him by creating her unique brand of encouragement cards. 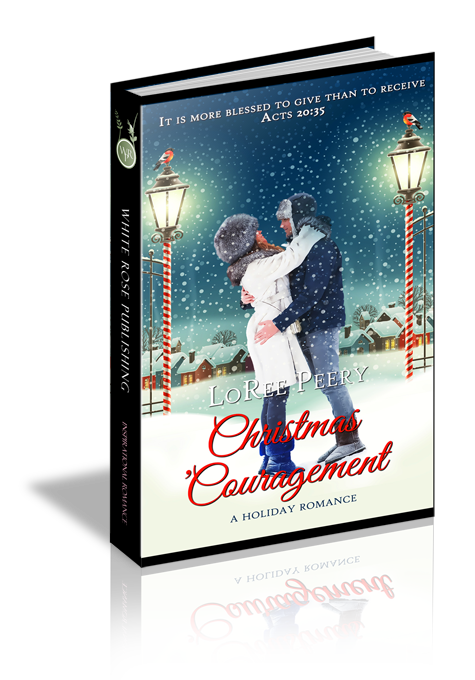 Her hope is to reignite the fire and love for Christmas and God, which Liam once had. The cards and ornaments countdown to Christmas, but what if Liam doesn’t want to be one of Zoe’s projects? What happens when her crush grows into something more? What if they both receive more than expected? Live in harmony with one another. Do not be proud, but be willing to associate with people of low position. “He needs ’couragement.” Zoe ignored the walk light and stopped at the curb. Her best friend, Meredith Gorgeous, went on ahead. Would Mom be mad if Zoe talked to the man on the bench? His crossed arms told her that he sought warmth from the ragged blanket, which was too small to cover the front of his body. Though his knees were pulled up, the metal bench had to be ice cold. Did the poor man have anyone to share Christmas with? From the corner of her eye she caught Liam stay his sister with a hand, and return her to Zoe’s side, where Meredith stood rooted. Zoe felt the heat of Liam’s heart-stopping blue eyes as he looked down at her. Zoe liked Liam’s protection. She’d never been afraid walking with Meredith in downtown Lincoln. On Saturday afternoons, he often escorted them from a movie to the SUV where Mrs. Gorgeous waited. The heat of Liam’s attention pulled Zoe’s gaze off the homeless man. She raised her eyes and had to tip back her head. Liam’s handsome face was capped by dark blond hair that brought his last name to life. He’d grown again since school began. She looked down to listen to what he said without being distracted by staring up at him. Her heart did a flip-flop at the sound of his deep voice. They’d never be in the same school again. Next year he’d go to high school at the same time she and Meredith advanced to middle school. “I did. He made me think of Santa Claus.” Meredith swung her heavy, long braid over her shoulder. “It shouldn’t be hard to find him with that white beard. I want this card to go to him. I wish I was older and had a job so I could buy him a big blanket to keep him warm.” Zoe handed the scissors to Meredith. “Why does anybody have a favorite number?” Meredith straightened the table mess. Three weeks later, the girls waited inside the lobby for Liam. He and his friends had met for a sci-fi movie, yet to end. Meredith bopped to a tune plugged into her ear. Zoe scanned past the movie posters, and sighed at the sight of Liam loping down the corridor. Her mom said she was too young to read romance novels, but as long as they were Christian and her mom had already read them, it was OK. Every hero in every book she read had Liam’s face. She’d never told Meredith the way Liam made her feel. He was strong and protected them. He did funny things to her insides, and she often didn’t know what to say or do. He thought she was his sister’s best friend, and nothing more. I want to marry Liam someday. He approached and yanked out Meredith’s earbud. Zoe waited, but he didn’t look at her. He waved to his friends as they headed for a different exit. Outside the theater, the girls held hands, Liam walking behind so it didn’t appear as though the three were together. Liam’s shoes slapped on the sidewalk as he ran to catch up. He placed a hand on each of their shoulders, preventing them from getting too close to the man. “I like that better. It takes courage to approach a reprobate like me. I’m not gonna hurt them, laddy. You girls encouraged me last week by that beautiful gold angel card. Prettiest thing my hands have held in a long, long time. You gave me hope, so much I’m gonna clean up and find a church Christmas Eve.” He gave a slight bow and moved aside. The girls didn’t say a word as they walked the two blocks to the SUV. Liam clambered into the front. “I don’t know.” She braved a look at Liam through the window, where he slouched in the seat, drumming his fingers on his knee. “He always keeps us safe when we walk downtown.” I’ll never forget Liam, either. Zoe closed the door on a lilting Irish version of “Hark! The Herald Angels Sing,” and set her coffee on a hard plastic table outside the coffee shop. The only one brave enough to sit outside on this December day, she folded her heavy scarf to cushion the icy seat. She put on her left glove and lifted the cup with her right, arrested by the sight across the street. A guy sat at the cement base of a street light strumming a guitar, his case open to passersby. It wasn’t the busker who caught her attention, but the man who’d stopped, staring down at the guitar case. So lost in her study of the man, she burned her mouth as she touched the fragrant brew with her lips. She couldn’t take her gaze off him, convinced something about the man was familiar. Her mind traveled back. Instead of the guitar player, she envisioned a hunched man with a white beard and a conversation with her best friend Meredith and her brother, Liam. Zoe sipped a cautious taste of her chocolate-flavored coffee and made sure it didn’t drip as she set it back down.